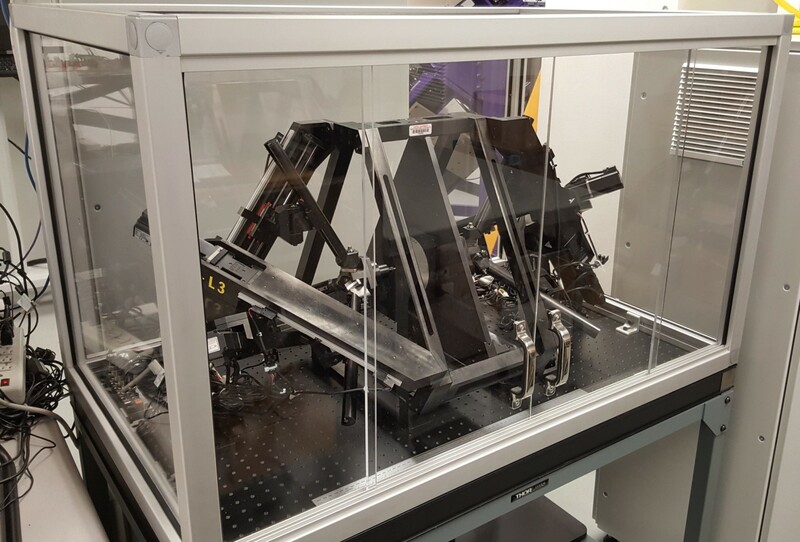 The first generation of macro-scale DSIF machine has been designed and assembled in the AMPL at NU. Two opposite x-y-z linear stages were designed to hold two forming tools. A novel DSIF desktop machine has been built for DSIF at meso scale. 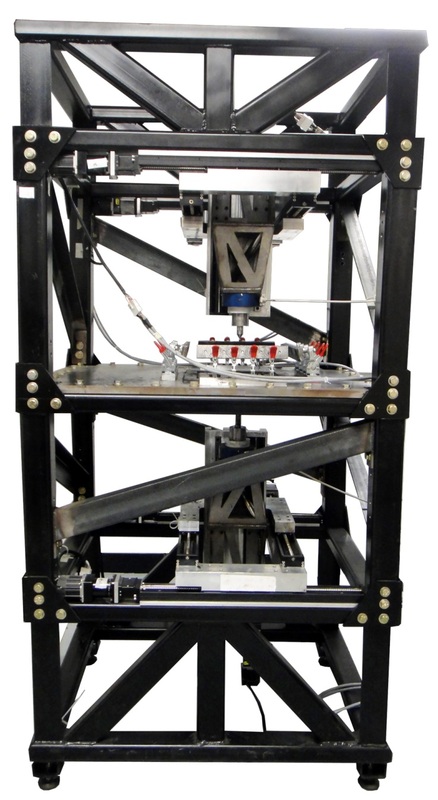 The new desktop machine with meso-scale motions was developed based on our design of the Tri-pyramid Robot. Big Blue was originally built in the 1952. Therefore, as you can imagine, she was not what would be considered state of the art. To rectify this, Big Blue was revamped. Data acquisition equipment was added including a displacement sensor and punch and binder pressure sensors and load washers. Also, hydraulic proportional valves were incorporated into the press hydraulic system to allow for binder force variation during the process cycle. The system is controlled and data acquired through Labview software from National Instruments. Through these renovations, Big Blue has become the cornerstone of research efforts at the Advanced Materials Processing Laboratory at Northwestern University. Big Blue is a 150-ton, double action HPM hydraulic stamping press. 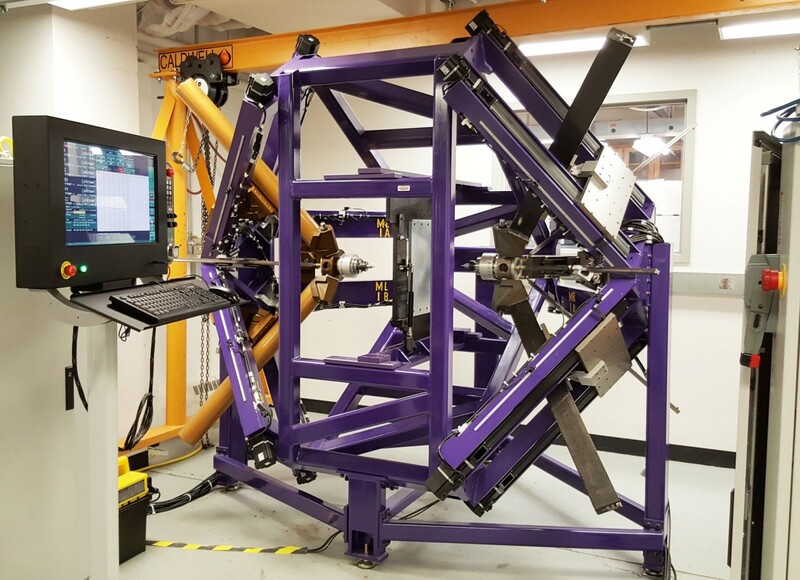 The Limit Dome Height test (axisymmetric stretch forming test) can be used to obtain various strain conditions by changing the specimen geometry. A 10.16 cm (4.0 inch) hemispherical punch is used to form the specimens. The sheet metal being formed is held in its position by means of a binder plate and draw beads so that excessive draw-in of the metal does not occur during the forming process. 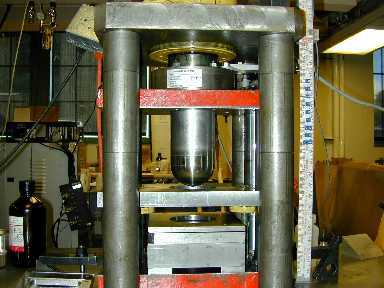 The binder plate is clamped by means of a cylinder on each side. These cylinders have a maximum capacity of 69 MPa (10000 psi) and they perform the clamping operation by an auxiliary pump. The power to the punch is supplied hydraulically and the punch is attached to a load cell with a maximum capacity of 444.84 kN (100000 lbs.). The motion of the punch is controlled by means of a controller which employs servo valves. The controller also has a digital display, which indicates the values of the load and speed and facilitates the reverse motion of the punch. A displacement sensor is also present in order to track the motion of the punch.